Granite is the currency in the construction of continents. Here we will time step through the existing surface expression of granites and related igneous and metamorphic rock in the Western US from the Archean to the present. Sediments are boring. You don’t want no downstream beer. Geologists love them because they stack nicely and behave in predictable ways, but they clutter up geologic maps so as to obscure the exciting stuff. Here we invoke Vulcan, and Vulcan only. 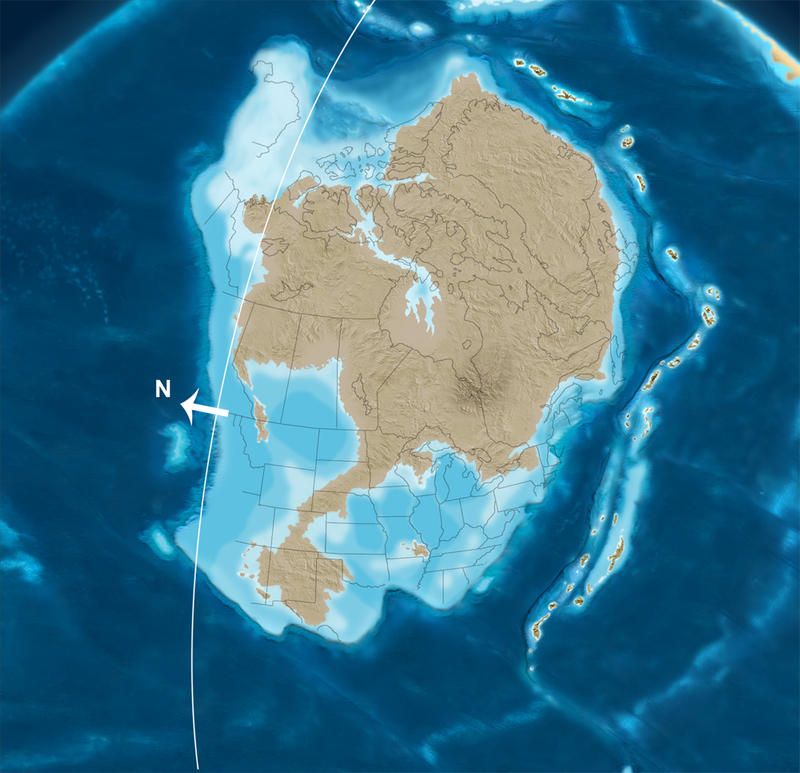 Before 2.5 billion years ago we have no idea where the continents were located. The Archean is expressed in the western US as currently NW trending granite batholiths in Wyoming and Montana. Between 2.5 and 1.6 billion years ago we see an extension of granitoids in a current north-south trend into Colorado and the Rio Grande Rift that we now think of as the Rocky Mountains. What is very strange is that we also see development on a different trend in Arizona south-west of the Colorado Plateau. Perhaps the Colorado Plateau was a separate craton then and differential rotation created the discordant trends. From 1.6 to a billion years ago we see further development along the discordant trends with new plutons in Colorado and extension to very near the current coast in the San Gabriel Mountains. 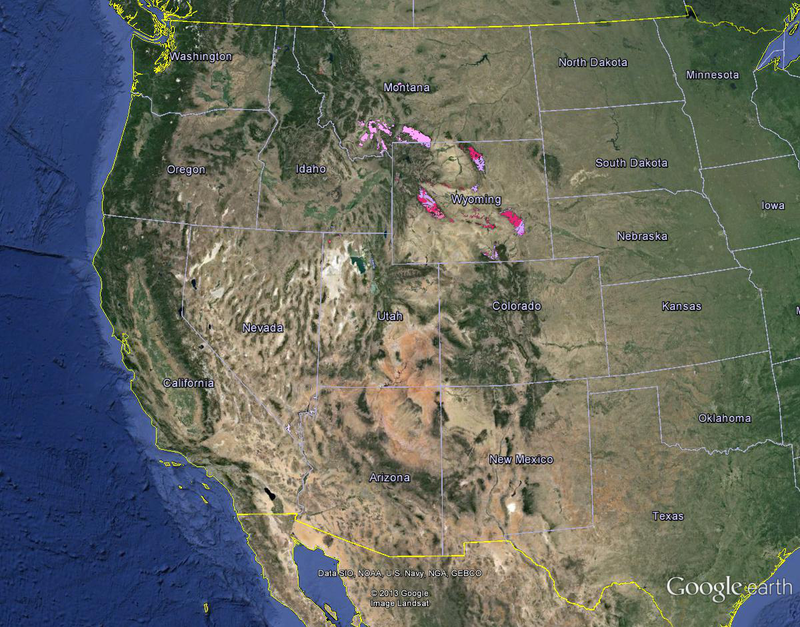 There is also activity in Montana and Idaho roughly parallel to the Arizona/California trend. The neoproterozoic between a billion years and the Cambrian adds the finishing touches to the Proterozoic mountain building era and ushers in the extremely boring Paleozoic where pretty much nothing happens. We begin to get some idea where the continents may have been. Christopher Scotese thinks they looked like this, but the magnetic alignments used to create the reconstruction are very uncertain before the Paleozoic. The western US would be Laurentia down there under the ice. Scotese even suggests my Colorado Plateau craton if you look closely. The Cambrian above ushered in the Paleozoic era where not much happened in the western US for a half a billion years. Mr. Scotese would have us floating idyllically as an island paradise at the equator in a drastic turn of events from 650 mya. Ron Blakey has it like this. 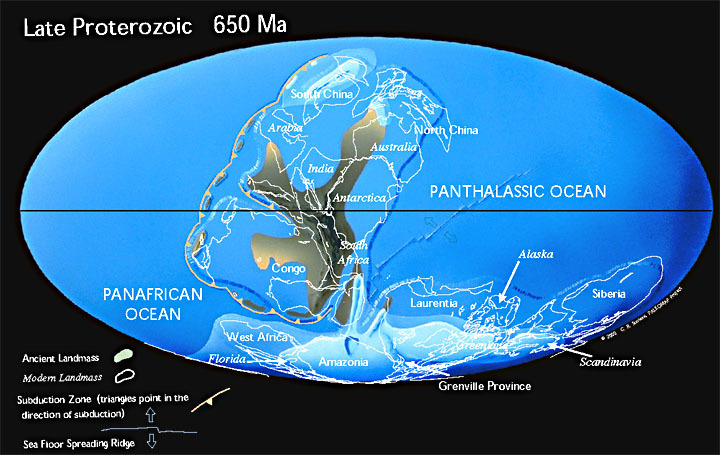 Anyway, for whatever reason, is spite of beginning the role of a castaway sailing into the Panthalassic Ocean it would maintain for most of the Phanerozoic, North America as evidenced by the western US shows very little tectonic activity in the Paleozoic. Here, jumping ahead a couple hundred million years to the Carboniferous we resort to showing some lowly sediments in the Roberts Mountain Thrust in Nevada out of sheer boredom. The trend of the thrust is unclear it seems to suggest the beginning of the current lineation in Nevada and to follow from activity in the Klamath mountains. This is about when the collision forming the Appalachians occurred. 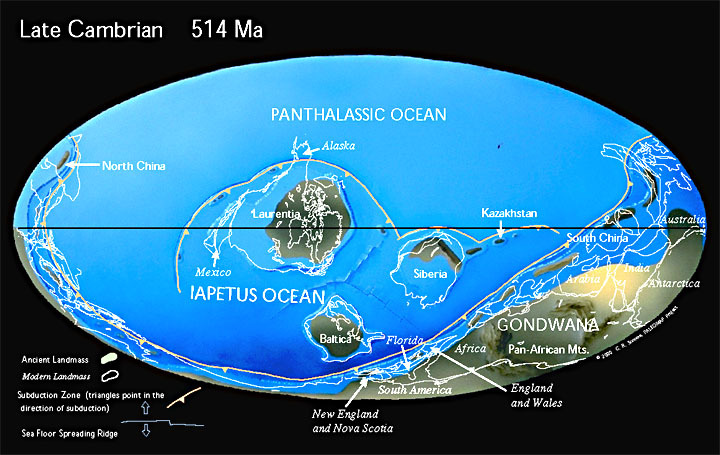 We close out the dull Paleozoic with the Permian about 250 mya as the great extinction occurred. Ron Blakey’s Triassic at 245 mya above. Important changes were brewing. 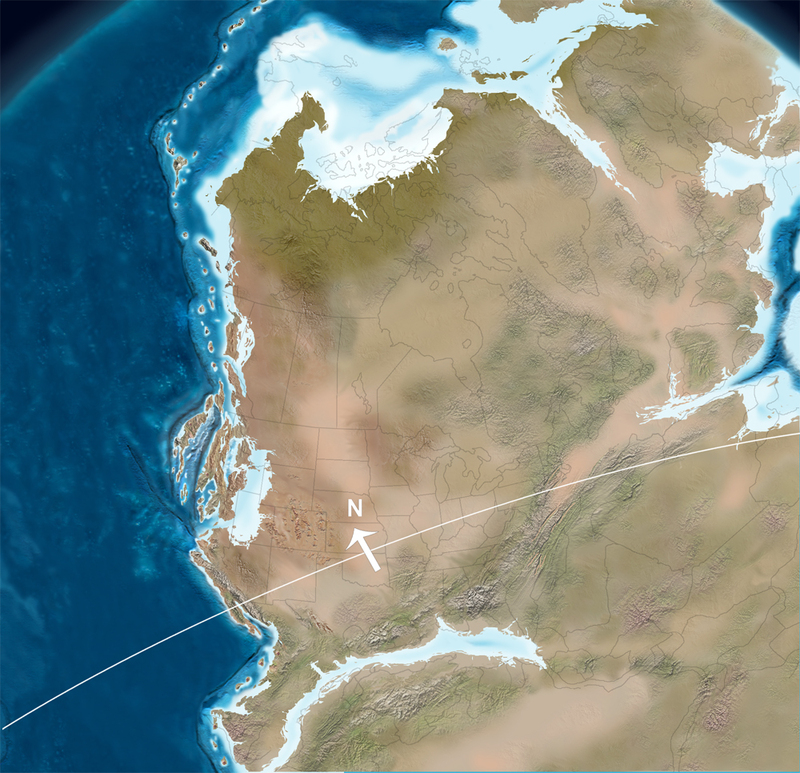 North America was separating to sail off into Panthalassa once again, a voyage that will bring continuous mountain building to the western US from the Mesozoic to the present. The great extinction at the Permian/Triassic transition was followed by wild fluctuations in Carbon isotopes as life on the planet alternately rebounded and regressed. Volcanos were spewing in a grand arc evident in vegetation today from the southern end of the Sierra Nevada batholith, to the Klamath, and through the Blue and Wallowa Mountains and into Idaho. By the end of the Cretaceous 65 mya as the dinosaurs passed, a circle was completed as the Idaho batholith joined the Archean granites. 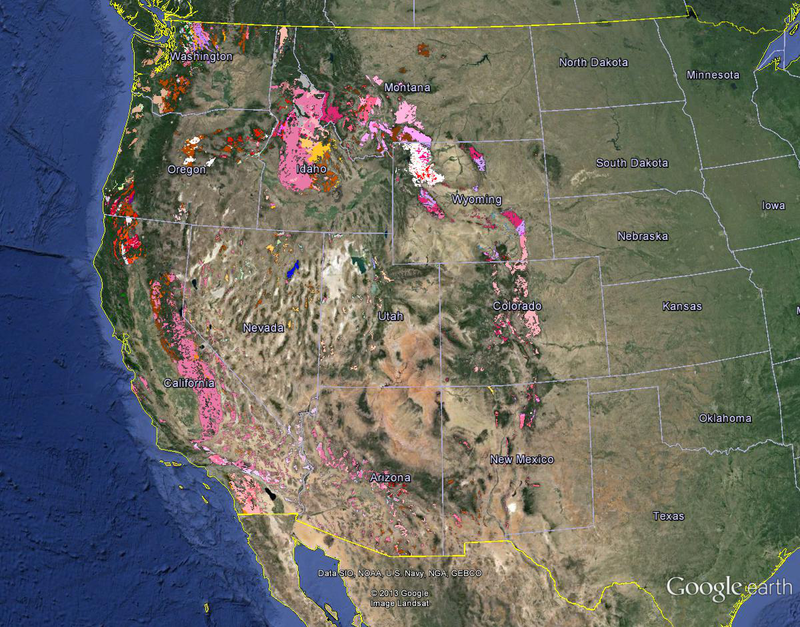 An important volcanic center was forming in northern Washington. During the Eocene andesitic volcanics began extending northward from the Klamaths and southward from Washington in the line we think of as the Cascades. The Absoroka volcanics formed at Yellowstone. In the Oligocene felsic volcanics swept across the Great Basin in Nevada and Utah and important volcanic activity began in the San Juans of Colorado and in western New Mexico. 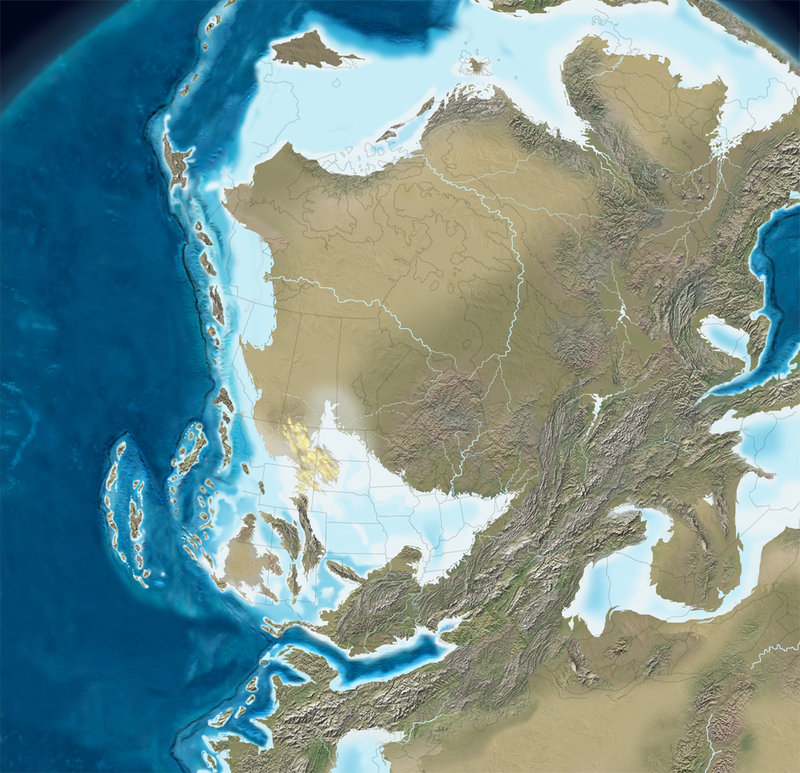 The Miocene saw the impressive spreading of flood basalts. Those things are almost as bad as sediments. There was also an interesting arm of felsic volcanics extending into southern Utah. Note the felsic volcanics beginning to extend up the edges of the Snake River Plain. 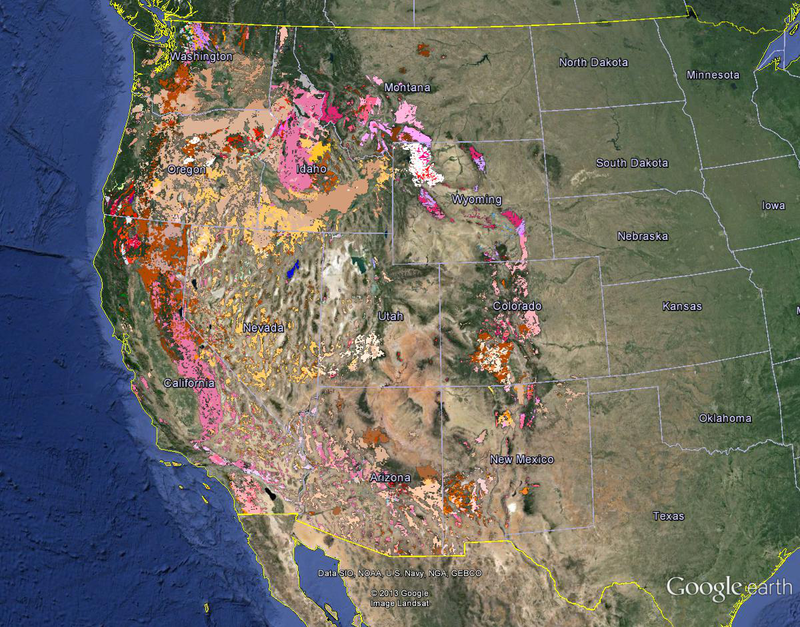 We jump to the present as flood basalts basically cover the Pacific Northwest. When we follow the granite we see a great concave arc formed during the Proterozoic, an interlude during the Paleozoic, and the completion of a ring of granite with a great convex arc in the Mesozoic. The Cenozoic basically extended the circle to include the Cascades and filled it in with a “bimodal suite” of flood basalt and felsic tuffs. This entry was posted in Geography, Geological Evolution of the Western United States, Geology, History of Life, Paleogeography and tagged Archean, Cambrian, Granite, Rio Grande rift. Bookmark the permalink. Interesting. Thank you very much. Did you travel radiocarbondating rocks? Not me. The dates are established from published literature by individual state geologists for the USGS state geology program.